We recently had the chance to try out a sampler of one of my favorite things...salsa:) The generous donating company: Global Warming Salsa! "This is where it all started: a fresh, fire roasted, all natural salsa featuring gourmet flavors blended into a mouthwatering taste and texture. No harsh aftertaste, just smooth fire roasted flavor. The original mild is packing just enough heat to get your attention, not too hot, but enough to let you know there are some peppers looking for your approval. We like to call them jalapenos and chipotles! We rate the heat index at 80 degrees…not too hot, almost comfortable…"
"This is what happens when you let a Chilehead play in the kitchen…a little more heat, a little more fire roasted flavor, a little more sweat when you are eating it. Same peppers as the mild, they just brought along a few more friends. Not too hot, but definitely something that smolders. The great thing about this salsa? It gets better the more you eat it! We rate the heat index at 96 degrees…some people may be better off looking for some shade with this one…"
"Serious heat lovers will like this one. Be careful you don’t get burned; this one brings the habaneros out to play…and it turns out that they play well with others. If you like to play with fire and are not afraid of getting burned, this is your salsa. A little hot at the beginning, but very hot the farther you go. 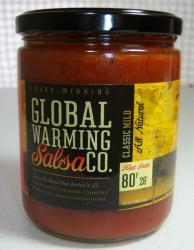 Global Warming Hot Salsa still comes at you with the mouthwatering taste that won all of those taste tests, but packing a wallop. We cannot say for sure that sunscreen will help you here, but get ready for a to hurt a little. The heat index on this one is a scorching 105 degrees…careful what you touch!" 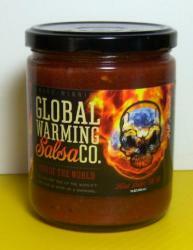 "This is the salsa that the experts warned you about...ready to play with fire? This is what happens when you ignore the warnings of the experts...one hot pepper tells another hot pepper, and they tell another hot pepper...next thing you know, the party is underway. And once the big boys get there, things can get out of hand. In a hurry! Featuring the infamous habanero (in many forms), the legendary bhut jolokia, organic ghost pepper, thai chile peppers, cayenne, chipotle, jalapeno...based on our award winning salsa classic recipe this is one of the hottest pure salsas (no extracts) you are likely to dance with... Are you ready for the consequences?" 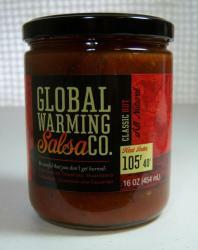 What we thought: Global Warming Salsa is pretty tasty. The best part is that they have a variety to fit everyone's salsa preferences. The kiddos preferred the Mild which has a "heat index rating" of 80 degrees. They love salsa, but can't handle as much spice as B and I so this was perfect for them:) The Medium salsa had a rating of 96 degrees and was my favorite. I usually go a little spicier, but the flavor of this one was incredible! Fresh tasting and perfect for dipping or pouring over pretty much anything:) The Hot was rated at 105 degrees and was pretty tasty, but in my opinion the heat kinda cancelled out the flavor on this one. B's favorite was, of course, the END OF THE WORLD rating:) He likes it spicy and said this version was spicy AND flavorful which is sometimes hard to come by in a salsa:) As major salsa lovers, ABCD Diaries gives Global Warming Salsa an overall rating of....an A+!! 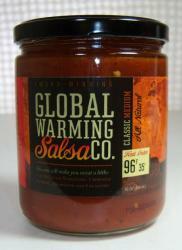 Buy It: Find these award-winning salsas at Global Warming Salsa or check the store locator for a retailer near you! Looks delicious. I think I'll stick to the Mild personally, because I'm too much of a wuss. Do they give some of their profits to climate change, or is it just a cute name?